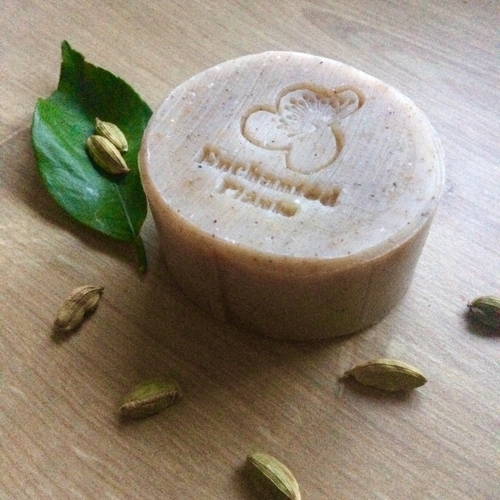 Cardamom and Coconut Cream Soap | Enchanted Plants Ltd. The loveliest warm, spicy and fresh exfoliating chunky soap made with lots of nourishing organic coconut cream and fine ground Cardamom seeds to make a brilliant body polisher. It also has a wonderful place in a utility room for gardeners and potato peelers to really clean but nourish hard working hands. Cardamom oil has a fresh but warm spicy scent naturally antiseptic and beautifully aromatic. Ingredients: Sodium Cocoate (Saponified Coconut oil), Sodium Sunflowerate, (Saponified Sunflower oil), Aqua (water), Sodium Cocoa Butterate (Saponified Cocoa butter), Sodium olivate (Saponified Olive oil), Cocos nucifera (Coconut) Cream powder*, Elettaria cardamomum (Cardamon) seed powder*, Elettaria cardamomum (Cardamom) oil*, Tocopherol (Vitamin E). Limonene, Linalool, natural allergens in Essential oils. * From organic agriculture.